Contemporary scholars like Robert Pippin and Robert Stern have debated whether Hegel’s position is to be regarded as a metaphysical or merely epistemological form of idealism, because it is not entirely clear whether Hegel regarded the distinctions that constitute the different forms of consciousness as merely the conditions necessary for understanding objects (Pippin) or whether they express fundamental commitments about the way things are (Stern). However, it is almost certainly true that Hegel’s idealism is both epistemological and metaphysical. 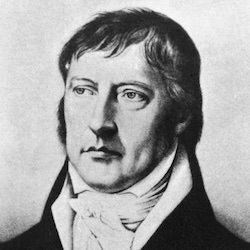 Like Fichte and Schelling, Hegel sought to overcome the limits Kant’s transcendental idealism had placed on philosophy, in order to complete the idealist revolution he had begun. The German idealists agreed that this could only be done by tracing all the different parts of philosophy back to a single principle, whether that principle is the I (in Fichte and the early Schelling) or the absolute (in Hegel).